I began photographing about forty years ago. My first teacher taught me that photography is a celebration of life. His words remain with me as I continue to explore my surroundings looking for the moment when the subject becomes transcendent. It may be the interplay of light and form, or it may be discovering a tiny aspect of the whole that reveals something new to me. I know when the moment is right because I experience it viscerally. By using photoshop tools and brushes to enhance images, I am able to achieve a painterly look that adds further expression to the image without changing its elements. As I am aging I find myself drawn to capturing the beauty and glory that lives in the midst of the aging process. I found no better place to explore this theme than in Old Havana Cuba, where I explored the city and discovered the alluring world of rooftops, high above the city and teeming with life. 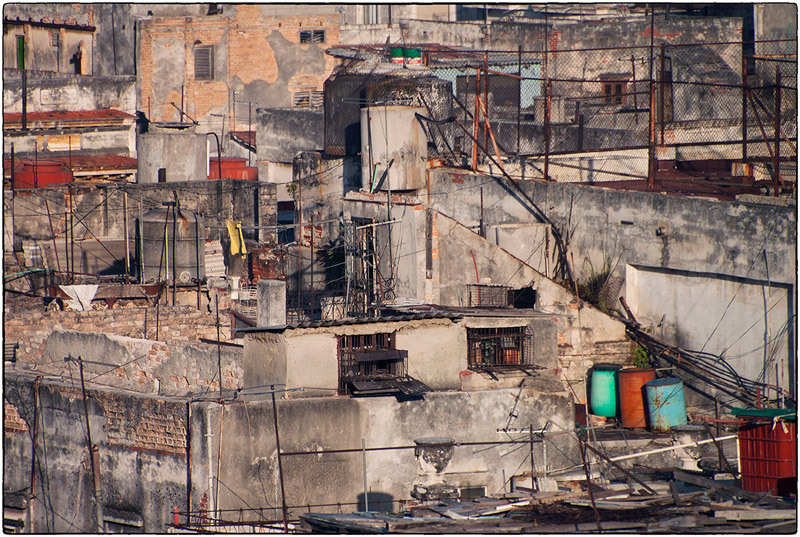 ​The roofs remind me of landscapes above the ground, thus the title of my recent series Roofscapes of Old Havana. Sadly, though many of the roofs and buildings are magnificent architectural structures, they are in varying stages of ruin. These roofs may be filled with small houses and shacks, some inhabited and others deserted; men playing dominoes; clotheslines with drying laundry; tiny flowers and vegetable gardens, pigeon coops; numerous discarded objects as well as objects stored for future use. The Cubans are extremely creative in finding ways to make use of what little they have for repairing and building things. One man showed me the many clothes hangers on his roof stored away for when they are needed to repair old cars. Still, there exists a significant amount of objects in a state of disrepair. But in this aging and neglect I saw haunting beauty and delicate reminders of the past. My work helped me to appreciate even more the Cuban people who live with few amenities but seem to have an enduring spirit and joy for life. Rust and Dirt is another series that joins beauty and elegance with decay. On a walk in Riverside Park I came across a rusty, dirty metal plate covering a grating. I was fascinated by the graceful lines formed by neglect and weather. I knew from the first photo that this would be an important series because I felt deep inside the excitement of seeing these exquisite lines and curves.